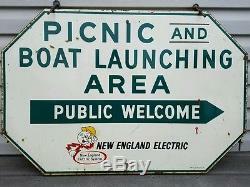 Reddy Kilowatt PICNIC & Boat Launching area sign. This IS the REAL deal. VERY RARE and valuable piece. This is the ONLY one of these I have EVER seen. 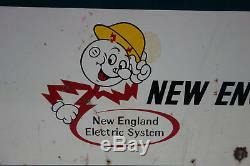 One fourth of Reddy Kilowatt images on Google are ours. This is a great sign. There IS NO OTHER anywhere period. I have spent three solid hours researching information on this sign and ANY other sign close to or similar to this one. 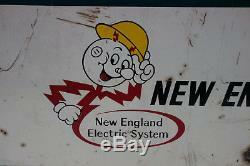 I frequently get many buyers asking for authentic and original Reddy Kilowatt signs. Any white spots or glare in the photo is camera flash/glare. 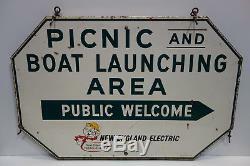 Please, PLEASE do NOT put on your "Larry the cable guy" hat and offer "five hundred buks" for this sign. All serious offers will be considered. 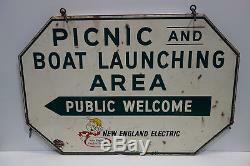 Sign is all original and has NOT been touched up, modified, fixed, repaired, painted or cleaned. 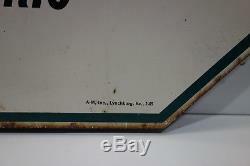 Sign is TWO sided/two piece, back/back 1, (see photos). Measures 36" by 24" by 1. Manufacturers stamp reads A-M Inc. Sign will be 52 years old in February 2017. A must have for the serious Reddy Kilowatt collector. The corporate mascot created in 1926 by Ashton B. Of the Alabama Power Company. Reddy has a light bulb for a nose, wall outlets for ears and a torso and limbs made of lightning bolts. The character was licensed to power companies across the United States to represent electricity as a safe and useful utility. Employed by more than 200 different companies at one time, he is rarely seen outside of antique malls and garage sales these days. The item "Reddy Kilowatt VINTAGE ORIGINAL REAL AUTHENTIC ONE OF A KIND ELECTRIC CO. SIGN" is in sale since Thursday, July 27, 2017. This item is in the category "Collectibles\Advertising\Communication & Utilities\Utilities". 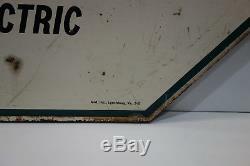 The seller is "electoliteliteforlife" and is located in chesterland, OH. This item can be shipped to United States, Canada, United Kingdom, Denmark, Romania, Slovakia, Bulgaria, Czech republic, Finland, Hungary, Latvia, Lithuania, Malta, Estonia, Australia, Greece, Portugal, Cyprus, Slovenia, Japan, China, Sweden, South Korea, Indonesia, Taiwan, Thailand, Belgium, France, Hong Kong, Ireland, Netherlands, Poland, Spain, Italy, Germany, Austria, Israel, Mexico, New Zealand, Singapore, Switzerland, Norway, Saudi arabia, Ukraine, United arab emirates, Qatar, Kuwait, Bahrain, Croatia, Malaysia, Colombia, Panama, Jamaica, Barbados, Bangladesh, Bermuda, Brunei darussalam, Bolivia, Egypt, French guiana, Guernsey, Gibraltar, Guadeloupe, Iceland, Jersey, Jordan, Cambodia, Cayman islands, Liechtenstein, Sri lanka, Luxembourg, Monaco, Macao, Martinique, Maldives, Nicaragua, Oman, Pakistan, Paraguay, Reunion.